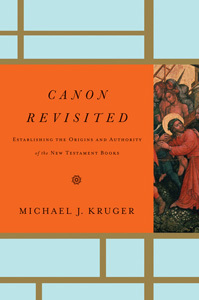 Canon Revisited: Establishing the Origins and Authority of the New Testament Books. Wheaton: Crossway, 2012. 368 pp. Perhaps one of the greatest objections to the Christian faith comes in the form of objections to the canon of Scripture: why these 66 books, and not some others? Indeed, I often struggled with defences of the faith that tried to wrangle out of this matter by pointing out that Jesus quoted Scripture, as if this sets the limits of the canon by itself. (It does not.) The other approach, giving the historical pedigree and apostolic authorship of each New Testament book, also seemed to fall short. After all, was the canon then only as reliable as the archaeological and text-critical evidence we have in hand? Or worse, our interpretation of that evidence? Kruger presents the case for a self-authenticating canon, a concept that many will struggle with. After all, we’ve been taught to imagine ourselves as neutral fact-collectors, and believe that we sit as judges over all truth-claims. The idea that some truth claims are foundational, and therefore cannot be verified by any higher chain of evidence will not be palatable to many. Kruger does take time to explain why foundational truth claims, like God’s existence, or the truth of the canon, must be the case, and that some circularity of reasoning is unavoidable in establishing such. He goes on to show why other models of establishing the canon, such as the Roman Catholic model, or the model that uses external evidence, are flawed (though not useless). Such models always result in some group of people, or set of evidences, holding more authority than the Word of God itself. If the Bible is God’s Word, and the canon reflects God’s Word, then the 27 books of the New Testament will both define what the canon should be, and exhibit those attributes themselves. His model of a self-authenticating canon is then unpacked. Kruger sees the marks of canonicity, as defined by Scripture itself as: 1) divine qualities (beauty, power and efficacy, and doctrinal, thematic and structural unity), 2) apostolic testimony (with the apostles as ministers of the new covenant), and 3) the corporate reception of God’s people. Kruger takes time to explain what he means by divine qualities, and convincingly explains how the Bible as a covenantal book required the apostles as ministers of the New Covenant to write down and explain this New Covenant. This took place in an environment in which God providentially exposed His people to these books, and His indwelling Spirit guided His people to recognise the attributes of canonicity. Considerable space is devoted to showing how bookish the early church was, and how a recognition of continuing written revelation was a widespread concept very early in the church. Kruger deals with some of the objections to books like Hebrews, Jude and 2 Peter, but here the explanations feel rushed and a bit perfunctory. In his defence, no book on canonicity could adequately deal with all the objections and counter-responses, without turning into a series of volumes. What Kruger has set out to do, he has done well. The self-authenticating model of the canon is a welcome theological and philosophical alternative to rather confused reasoning on this matter. I commend this book to Christians serious about knowing their own philosophical basis for holding to the New Testament that we do.